Help evaluate how students can make a difference in global health through personal responsibilities and contributions. Summarize and communicate effectively via visual, textual, and oral means. This Sample Calendar is modeled after the annual Global Health Conference held by the seventh-grade students and social studies teachers at the Charles E. Smith Jewish Day School in Rockville, Maryland. The following Instructional Procedures and Resources are organized into a four-week time frame. This section provides instructional activities and resources that involve students in researching, creating display boards, and writing papers in preparation for the Global Health Conference. However, the instructional activities and resources are presented as independent modules that can be used on their own, so that the guide can be scaled down for its use in a single classroom as well. Please review the preparation suggestions provided in the Sample Calendar before starting classroom instructions. Distribute a copy of the Health Survey to each student and have students work in pairs to respond to the survey. Place a blank Health Survey transparency on an overhead projector. Review and summarize selected student responses on the transparency. The Teacher's Health Survey provides some discussion suggestions. Distribute a copy of the Human Rights statement or the Alma Ata statement to each pair of students to read and complete the tasks listed at the bottom of the handout. Place a Human Rights statement transparency on an overhead and solicit student responses. Record them on the transparency. Place an Alma Ata statement transparency on an overhead and solicit student responses. Record them on the transparency. Guide discussions on each transparency to help students consider health as a basic human right. [Note: More extensive instruction on the topic of health and human rights is available in the Health and Human Rights lesson plan. If appropriate, use the following activity to introduce or review the words that students may encounter in various sources while they are researching and gathering information for the global health project. 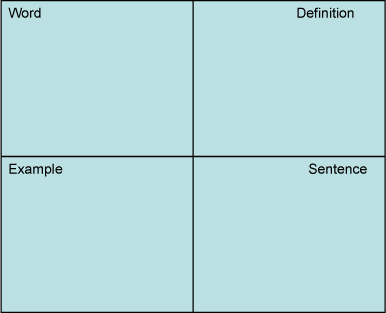 Print a couple of copies of the Vocabulary List and cut out each rectangle containing a word and its definition. You can add additional words and definitions on the blank rectangles. Have students work in pairs and give each pair a word rectangle and a copy of Word-graphic organizer. Ask each pair to complete the Word-graphic organizer for their assigned word. 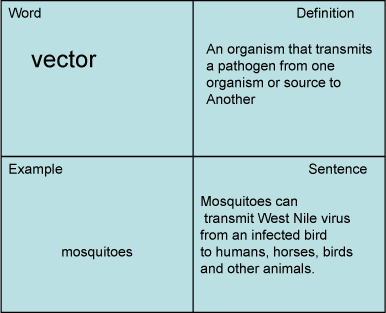 Place a Word-graphic organizer example on an overhead projector as an example of how to complete the graphic organizer. Review each word and record student responses on a Teacher's Vocabulary List transparency on an overhead projector. Review and check if any diseases listed at the bottom part of the Teacher's Vocabulary List have been mentioned previously. Ask students to identify other poor health conditions that can affect them or those around them. Have students think about the cause and type of the condition using the words from their sentences and the vocabulary list. Use news stories you have collected to inform and engage students in current local or global health discussions, which builds literacy skills for comprehending and finding information in the kind of sources they will be encountering in their research. You may consider students' interests in a country or a health topic in assigning a country to each student. To match students' interests, distribute copies of Global Health Interest for students to complete and turn in. You can review students' interests and use the information to match them to countries as much as possible. For a random assignment, have students pull out a piece of paper with a number. Place a world map in front of the class and have the student with #1 pick his/her country from the map first, then have the student with #2 pick, and so on until everyone has picked a country. Keep a list of the names of students and their assigned countries. Tell students about the Global Health Conference event, where they will present their assigned country's information as if they were attending a professional meeting. Inform them that they will conduct research, create a display board and write a two-page essay about their country. Provide each student with a copy of the Checklist that lists criteria for the display board and essay. Review each checklist and tell students that you will guide them through the research and preparation of the display board and essay. Students conduct guided research tasks; identify a health topic for the country assigned for research; access resources needed for their global health project; and learn how to cite sources in their papers and display boards. This activity is conducted in the school media center, computer lab and/or library. Distribute copies of List of Sources, Country Profile Worksheet, and Health Topic Worksheet to each student. Have students write in the name of his or her assigned country on the corresponding area of each worksheet. Review Teacher's Annotated List of Sources, Teacher's Country Profile Worksheet, and Teacher's Health Topic Worksheet for descriptions of the sources and instructional suggestions. Tell students that the two worksheets are to help them collect information to create a display board and write a two-page essay about their assigned country and its health issues and solutions. If appropriate, refer to the Checklist and review the criteria for the display board and essay with students. Depending on the students' age and level, demonstrate to the class how the data for the "World" column are found in the reference materials, then have students research and complete their worksheets; or have students work in pairs to gather data for the world and their assigned countries. Have a speaker come and talk to students about his or her work and experience in a health-related field. Prepare speakers so that the topics they present to the students can help students understand multiple factors that affect health. A recommended format is for the speaker to talk briefly about their work and have students ask questions. During week 4, students finish editing their essays and the display boards and practice talking about their research—i.e., oral presentation-before the Global Health Conference event date. Students receive constructive feedback on their essays and display boards, and update them appropriately. Peer feedback: Have students work in groups of 2-3 students and then provide comments on the essays and display boards prepared for one another. Have students refer back to the Checklist for the display board and essay so that their review comments are helpful and constructive. Have students revise and update their essays and display boards for presentation at the Global Health Conference event. Have students practice talking about their presentation with others. For example, pair students to talk to each other about their research on health issues and solutions of their assigned countries. Distribute a copy of Reflection Survey to each student to complete after learning about other students' work. Students know where to display their boards and essays and when they should be stationed beside their work as the conference starts. Students engage in discussion with other students, parents and educators about various global health issues and solutions. They are able to summarize their research findings and to express what their roles can be in making positive differences in global health. Students submit their work for grading. Students conduct research on issues and interests by generating ideas and questions, and by posing problems. They gather, evaluate, and synthesize data from a variety of sources (e.g., print and non-print texts, artifacts and people) to communicate their discoveries in ways that suit their purpose and audience. Students use a variety of technological and information resources (e.g., libraries, databases, computer networks and video) to gather and synthesize information and to create and communicate knowledge. Analyze how information from the community influences health. Express information and opinions about health problems. Students will be able to gather relevant information from appropriate resources. Students will be able to interpret information to generate new understandings and knowledge. Students will be able to communicate findings by producing materials in an appropriate format. Students create, interpret, use, and distinguish various representations of the earth, such as maps, globes, and photographs. Students work independently and cooperatively to accomplish goals. Students apply knowledge of how groups and institutions work to meet individual needs and promote the common good. Students examine persistent issues involving the rights, roles, and status of the individual in relation to the general welfare. Students examine and describe the influence of culture on scientific and technological choices and advancement, such as transportation, medicine, and warfare. Students explore the causes, consequences, and possible solutions to persistent, contemporary, and emerging global issues, such as health, security, resource allocation, economic development, and environmental quality. Students demonstrate understanding of concerns, standards, issues, and conflicts related to universal human rights. This guide is modeled after the annual global health conference held by the seventh-grade students and teachers at the Charles E. Smith Jewish Day School in Rockville, Maryland. Special credit and thanks go to Janet Collier, whose ideas and vision have resulted in engaging students as well as their parents in global health issues at the Charles E. Smith Jewish Day School.